Employees in Garver's Fayetteville, Arkansas office won first place in the Bicycle Coalition of the Ozark's bicycle commuter challenge for its size category. This is Garver's second year in a row to win the challenge. Seven Garver employees participated this year. In addition, Brandon Bynum received a certificate for having the second longest commute. He pedaled 15 miles one way. 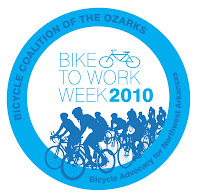 The Bicycle Coalition of the Ozarks conducts this competition during May's National Bike to Work Week to reward businesses with the highest percentage of bicycle commuters and to raise awareness about the viability of bicycle commuting as a way of life. The commuter challenge invited all businesses in Washington and Benton counties to participate in the low-cost, healthy way to travel to work.